Q: How did you come up with the idea for The Dragon Keeper, and how long did it take you to write it? Did you have a special routine or place in which you wrote? A: I was on a business trip in London in December of 2006 when I read an article in the paper about a Komodo dragon reproducing via parthenogenesis at the Chester Zoo. Since it was so close to Christmas, the article made a lot of overt comparisons to the Virgin Mary, and the tone of the entire piece was very light. It was clearly intended as entertainment. I immediately ripped the article out of the paper and read it obsessively in my hotel room over the next few days. I knew there was a much bigger story there, but I had no idea it could be a novel. A few weeks later, I was watching The Daily Show back at home when they aired a clip from the Chester Zoo. The dragons had hatched, and one of the zookeepers told the cameraman that it was the best day of her life. Jon Stewart made some joke about how pathetic this woman was, and in that moment I knew I had to write this story. I was fascinated by this woman, by the revelation that animals had begun reproducing without mates, and by the idea of a love story between a zookeeper and a dragon. 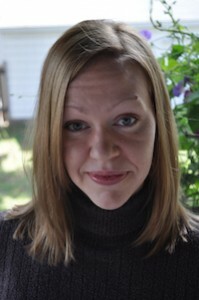 I wrote the book during my last two years in the Hamline MFA program, and it became my thesis. Since I have a full-time job, I wrote mostly during my lunch breaks and before classes at night. After I graduated, I revised the book two more times in the two years that followed, while working on other projects as well. Q: Have you ever worked at a zoo? A: No, I never have. My zookeeper abilities don’t extend much beyond feeding a cat. My work life has been largely spent in corporations, and that’s the employer that ultimately came to the page. The Zoo of America is, of course, completely fictional, and I began thinking of it as corporate America, as in: “How would corporate America behave if it owned a zoo?” The actual zoos I was lucky enough to visit while researching the book were conscientious, humane institutions that bear little resemblance to the Zoo of America. Q: Are you trying to say that zoos are a bad institution? A: I didn’t want the book to be strictly pro-zoo or anti-zoo, but I did want to raise questions that we don’t always think about when we visit zoos. As the planet’s current conquering species, what is our responsibility to the other creatures who live here? We’ve come a long way from the roadside menageries, but do we have the right to capture and display animals for entertainment or education? What if, like Komodos, the species is losing its natural habitat? There are a lot of issues to consider, and I hope I’ve been able to introduce some of those questions for readers. A: Although I would have loved to travel to Indonesia, my budget dictated that most research had to be conducted through reading. Because Westerners first encountered the Komodo dragon relatively recently, there aren’t a great deal of academic studies available. I read the ones I could find, including Walter Auffenberg’s definitive 1981 book based on his research while living on Komodo Island. I also wanted to get a sense of zoo life, without getting too focused on the habits of any one particular zoo. I visited the Memphis Zoo in 2007 and was fortunate enough to interview the curator of reptiles as well as both keepers who looked after their two Komodo dragons. At one point I mentioned Auffenberg’s comment that early expeditioners thought the dragons were deaf because they didn’t react to gunshots. The curator had never heard that and seemed incredulous of the fact. Later he showed me why. When we were behind the Komodo exhibit, he opened the top half of the door that led inside and said, “Jeff!” Jeff, the eight-foot-long Komodo, immediately turned 180 degrees and barreled for the door. The curator and I had to retract our heads and slam the door shut before Jeff could rear up over it into the hallway. “He can hear,” the curator said, grinning. Q: Is parthenogenesis really possible? A: Yes, it is, and there are documented cases of parthenogenesis in Komodo dragons. When I happened to find that article about Flora, the Komodo at the Chester Zoo who reproduced via parthenogenesis in 2006, I was immediately fascinated by the idea of sexual animals reproducing without mates. In the course of The Dragon Keeper, we learn that Jata’s offspring are even more unique than Flora’s. What happens with Jata specifically has never been known to occur in Komodos, but it seemed to me like the next logical evolutionary step, although I’m as much at a loss to explain it as Meg and everyone else in the book. To me, it’s still somewhat of a miracle. Q: Are there really Komodo dragons like Jata? A: Yes! It was very important to me to portray Komodo dragons as accurately as I possibly could. I researched the species extensively, and in several of the studies I found references to a Komodo dragon named Bubchen who lived in the Frankfurt Zoo in the early twentieth century. By all accounts, she was an extraordinary animal who became completely acclimated to living with humans. Many of Jata’s behaviors are based on what I could find out about Bubchen, and I couldn’t resist including a small tribute to her in the book as well. 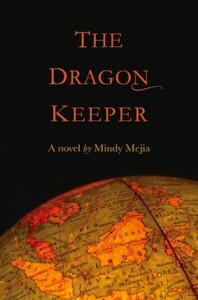 Q: Would you describe The Dragon Keeper as a love story? A: Certainly Meg is embroiled in a love triangle for much of the story, but ultimately I’ve always seen this as a love story between Meg and Jata. Sometimes the perception is that a human-animal bond is simpler than relationships between humans, but I’ve always thought it raises many compelling questions. Why does this person choose to give their affection to an animal instead of someone within their own species? And then you have to look at the animals’ side of the relationship. Are they even capable of returning affection? What are the circumstances of their lives that have brought them into close contact with humans instead of others of their own species? In Jata’s case, you also have to understand that she’s an alpha predator, and her instincts will always be at war with any attachment she is capable of developing on Meg. What intriguing ideas Mindy puts forth in this book! I just purchased it in the Kindle edition and will download asap! Very interesting Q&A as well. Thanks, everyone. Thanks, Nora! I hope you love the book as much as we do. This book looks so interesting! I can’t wait until it comes out to pick up my copy! Thanks, Amy! And the book is available right now … below is a link for ordering online, and you can also go into any bookstore and find it or order it. Thanks so much for reading!